I love all Rustoleum. I'm interested to hear suggestions. I recently bought my oil rubbed bronze at Wal Mart. It's by Krylon. The can says "Brushed Metallic" and I got the Satin finish (is there any other kind?) Color is oil rubbed bronze.....check it out at Wal Mart! I am interested to read the comments here. I haven't tried an ORB spray paint before...I am sort of new to the whole spray paint thing. :) What projects do you like to use the ORB with? I was doing a bunch of spray painting 2 years ago and bought a semi-pro spray set at Home Depot, on sale of course! It has a small compressor and works great and I can use any paint I want to in it. I did use an oil base to spray a wrought iron set and the cleaning w/ turpentine was a bear, but other than that I love it. You need to get one w/ all the painting that you do! I wrote to Rustoleum to ask them about this. The response they gave me was that thy can't control who chooses to carry the product, but you can do a special order through places like Home Depot, but you would have to buy a whole case. I am very very tempted. I love that stuff! I bought the same stuff Judy mentioned, from Wal Mart. It was $3 a can, oil rubbed bronze in satin & I loved it. I bought some pendant lights & the color didn't go with my kitchen decor & this paint worked perfect! I don't have a favorite one. I normally go with the one I think might work best. I guess I should narrow it down. I need to check out WalMart cause I just looked again yesterday and it's GONE from everywhere!! I. am. freaking. I went to the Krylon website after reading this post and searched until I found their "Brushed Metallics" section. If you click on the color samples near the bottom they have an oil rubbed bronze. I saw the ORB by Rust-Oleum yesterday at Joanns. It was almost $8 a can, but it might be worth it. I may go back and get it to repaint a shower caddy. Is that a smart thing to do? Paint something that will sit in a shower? Hmm...it is Rust-Oleum, afterall. Rust-Oleum has brought back the Oil-rubbed Bronze and Vintage Copper in the Stops Rust Metallics line, and they can be found at all Lowe's stores. Oh no!!! I have half the door knobs sprayed with that paint. I have to find more!! I don't think that the brushed metalics other posters mentioned are the same as the oil rubbed bronze in the American Accents line. I have read on other blogs that dark brown flat spray paint that is marketed as camoflage spray paint (you can buy black and green as well to create camo) looks almost exactly like American Accents ORB - especially if you rub it with a very light coating of wax or oil after dry. I bought some but haven't tried it yet. I LOVE ORB by Rustoleum! They actually reintroduced it in the Universal brand instead! Yippee! I'm not sure if you found that out, but I get it, 3 or 4 cans at a time, at Home Depot for $7.50! I couldn't find the Rustoleum ORB so I bought the Krylon to do my old-fashioned radiator in my foyer. It was less than $3 at Walmart which worries me that it won't be as nice as the Rustoleum. Has anyone used both and so can offer some insight please? Thanks for the information and for the "taste test" photos, too. I just ordered six of the Rustoleum ORB through hardwareworld.com for $6.69 per can. Thanks for letting me know about hardwareworld.com! AN, I still have one full can of the Rustoleum (that's me with the mirror above) but it's MINE, ALL MINE!!! I'll probably hoard it till it's no good anymore, ha! I like the Krylon Brushed Metallic ORB paint, but it's only for indoor use. 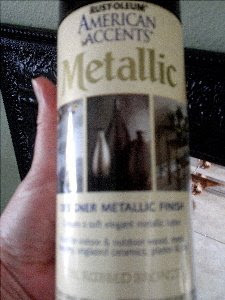 I haven't found an acceptable substitute, since most indoor/outdoor ORB spray paints, lovely as they are, are shinier, with little metallic flecks. I don't want fixtures, and, in particular, light fixtures, that are as shiny as a bicycle! Conspiracy theories abound- the big box stores that sell new fixtures don't seem to carry a lot of paints in the metallic line that would be great for repainting old fixtures... The next thing seems to be to try a sprayer, with a custom-mixed outdoor paint.